Whether it’s dancing on a train or promoting his movie in a train, the undisputed Badshaah of Bollywood Shah Rukh Khan does it all, that too in style and charm. And he took that style and charm to Symbiosis Institute of Design, Pune, as well when he recently visited the college to promote his already released movie Raees. 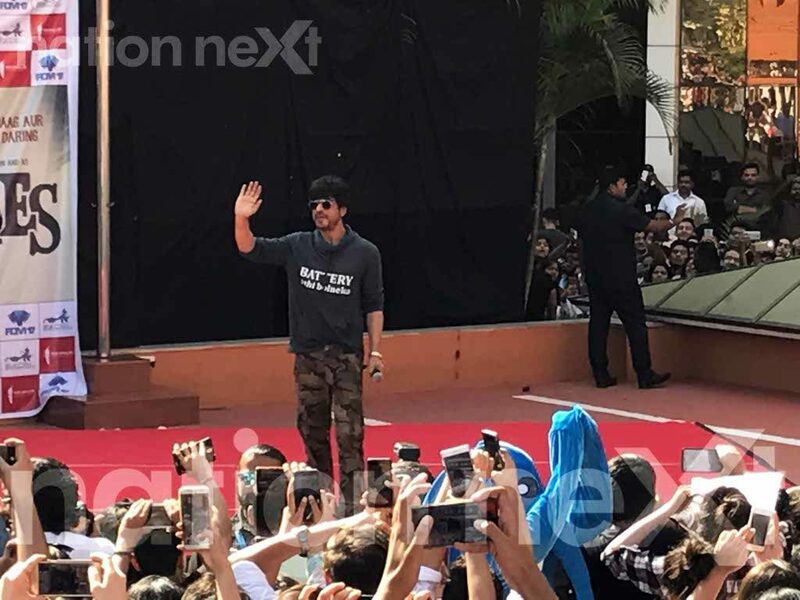 Dressed in cargo pants and a hoodie which read, ‘Battery nahi bolne ka,’ SRK made students present go gaga over him even as he blew kisses and waved at them. And when he posed in his signature style of spreading his arms, the 51-year-old actor made the young girls drool over him! Speaking to the students, he said that he was not at the college to promote his film Raees, but he was there to spread love as he loves visiting colleges. SRK who’s known for his witty remarks was at his wittiest best at Symbiosis too. Speaking about his movie, he said, “If you have watched Raees, then it’s good but if you haven’t, that’s even better!” He also asked the emcee to not be so strained and anxious. When he recited some of his famous dialogues, it was surely a treat to the students and even the staff. Coming to the aid of students, he then requested the professors to give the students the attendance they have missed because of being present at the event. All for the love of SRK! Symbiosis Institute of Design had organised quite a few contests revolving around Raees and SRK. These contests were conducted as a start of the college’s Fundamental Fest 2017. While some students dressed up like SRK as part of the ‘Dress up like Raees contest’, others were seen shaking a leg in the ‘Best SRK dance performance’ contest. When a group of students performed on the song Zaalima from Raees, SRK couldn’t stop himself from joining them on stage and dancing along with them! And when a girl dressed exactly like SRK in Raees was called on stage to felicitate with a gift for the same, SRK gladly taught her a dialogue – ‘Kaun mai ka laal hai jo mujhe pareshaan kar raha hai!’ She was told by him that she can use the dialogue if a guy troubles her! A lot of students brought gifts for King Khan ranging from the sketches of him to the painting of the poster of his film Raees and SRK obliged all of them as he cheerfully autographed the gifts.